The "Eight Little Preludes and Fugues" (BWV 553–560), historically attributed to J.S. Bach, have been a cornerstone of organists' repertoire for many years. They are among the first works encountered by most organists during their training, and for many, they continue to remain an essential part of the service-playing repertoire. 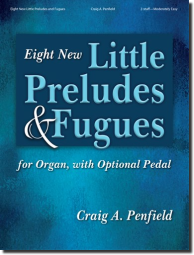 With this volume, Craig A. Penfield has created a "new" set of eight little preludes and fugues that takes its inspiration from the original collection. Penfield has written these works in a mild "neo-baroque" style that combines strong elements of traditional baroque writing with some contemporary touches. Pedal throughout these pieces is entirely optional. There are markings of where pedal can be used, but any or all of these can be omitted, and the "pedal" notes are easily played entirely in the hands.